It's been a long time since I submitted anything here, so please excuse my rustiness. I have posted this wallpaper somewhere else, and forgot to post it here. As most Berserk fans might agree, there are never enough Berserk wallpapers. - I used the Berserk Musou game render published by Koei Tecmo. - After many tries with different ideas, I opted to use a simple background. - I used filters mostly, trying to create a wind-like effect around the feather/weapon. - I used the same smudging technique I rely on when making small forum signatures and avatars: duplicating the render and smudging from bottom to top while using different opacities and filters on each layer. 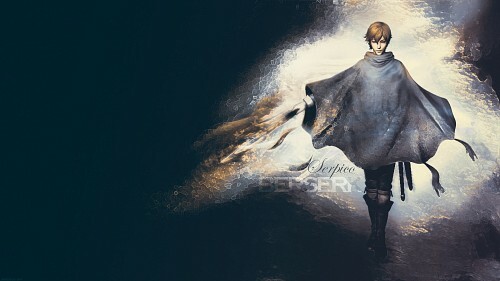 - the effect on the feather/weapon was made using a combination of smoke brushes.